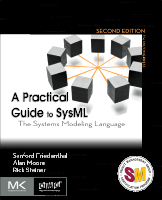 Welcome to the website for Friedenthal, Moore, Steiner: A Practical Guide to SysML: The Systems Modeling Language, 2nd Editionnd Edition. Refer to the official OMG SysML website for updated information on SysML, including specification status, tool vendors, publications, and a discussion group. The SysML material is an introductory course to SysML, which primarily focuses on the basic feature set required by OCSMP certification. The OOSEM material is based on the MBSE method described in Chapter 17 of the 2nd Edition (Chapter 16 of the 1st Edition). The material may be periodically updated to reflect updates to the SysML and OOSEM material. The models from Chapters 3, 4, 16, and 17 from the 2nd Edition are included below in both Magic Draw v17.0 format (mdzip) and in HTML. A diagram called the Figure Map is included in each of the models to provide a simple way to navigate the model. If you do not have a Magic Draw, just download the HTML files to your desktop, unzip the file, and put in a separate folder. Then select the index file to access the model in HTML.